The Lifestyles Center is mostly a series of rooms located off of the main hallway. Here, dietary needs and exercise are focused on with shelves set up to create a mock grocery shopping experience, vials filled to show patients how much fat, sugar, or sodium is in certain foods and condiments, a kitchen set up so patients can practice preparing foods, and an exercise room. Among the services provided by The Lifestyles Center are label reading classes, sessions for teenagers on teen obesity, and group classes where patients are able to do mock shopping. Meanwhile, down the hall is the ASC, which Vogel said is usually very busy, although on the day I was there the pharmacy seemed to be busier. Here, patients wait to be seen in what is an urgent care clinic. Urgent care clinics exist to serve patients in what is intended to be a prompt manner for conditions that require immediate attention, but do not necessarily need an ER visit. 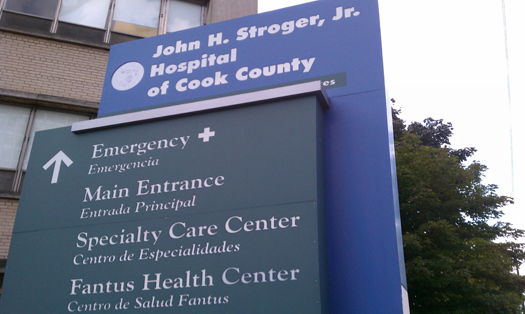 On Cook County shutdown days, the ASC is the only clinic in the CCHHS that remains open. While walking back to Stroger Hospital, Vogel tells me that a need for a new Fantus Health Center has been recognized. The rebuilding of Fantus Health Center was included as part of the CCHHS strategic plan, but there currently isn't any capital to support the project. A lack of money has affected various elements on the block the Stroger campus occupies. In addition to the Fantus Health Center not receiving a new building, the old hospital still sits empty, even though a plan to refurbish the building for administrative offices had been approved. The finances for the hospital are a bit complicated because of how it operates and who runs it. For Stroger Hospital, funding comes from a county subsidy, and patients with insurance and can pay for their treatment by themselves. In 2008, an independent board was established to run the CCHHS. Currently, the board consists of doctors, health officials, Cook County Commissioners and people who run hospitals in the city. Since the inception of the independent Board of Directors, the hospital has been trying to minimize how much of a county subsidy the hospital receives. The subsidy accounts for only about a third of the budget and the entire budget for the hospital goes before the board for approval. Additionally, whatever revenue the hospital brings in, the board takes in and then disburses to the hospital. According to data released to the Illinois Department of Public Health, 89 percent of Stroger Hospital's Inpatient Revenue for 2009 came from Medicaid payments, 8.7 percent came from Medicare, 2 percent from Private Insurance, and 0.3 percent from people who had no insurance, but were able to pay for their treatment out of pocket. (Link opens up PDF file.) Because the hospital treats a large number of people on Medicaid and are considered to be individuals with a low-income, it is categorized as a "disproportionate share hospital," according to Vogel. As a result, the state works hard to get the hospital its payments quickly. But the hospital still faces problems when it comes to getting patients. After the passage of All Kids, the hospital saw a dip in patients for pediatric and obstetrics care. As a result the hospital plans to launch an advertising campaign focusing on those departments. Additionally, the hospital is now publicizing that they have valet parking for mothers and pediatric patients. "We're here to serve everyone, but in terms of revenue, the more revenue we generate, the more we can meet our mission to serve them," Vogel said. In the meantime, the main public hospital in the city faces its future and the current hospital's tenth anniversary next year. "We'd like to do something to celebrate the tenth anniversary and let people know we're here," Vogel said. Stroger Hospital is currently the newest hospital building in the Illinois Medical District, but will lose that title when the new Rush University Medical Center opens in January. But Stroger Hospital will go on serving anyone who comes through its doors, regardless of who they are and their ability to pay, trying to provide them the best care possible. The new hospital opened in December 2002, just a few yards away from the original hospital building. The hospital provides: Emergency and Trauma services , adult and pediatric Emergency services, Radiology services but what they are missing is ">drug rehab facilities. I think with this kind of services they could increase their income substantially.